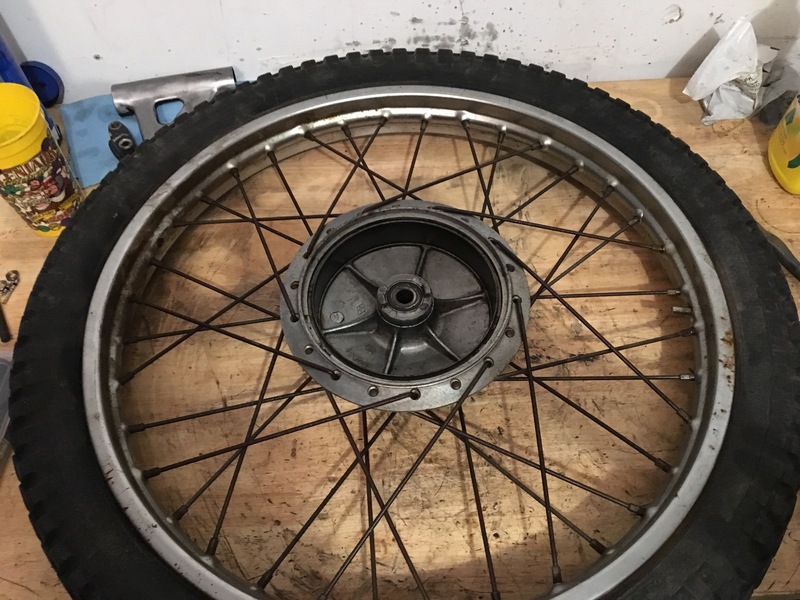 I have... a new gas tank, I've ordered a nickle-plated full exhaust system from Circle F, and I have a Powerdynamo generator which will replace the old magneto and should give 12V DC up to 180W. 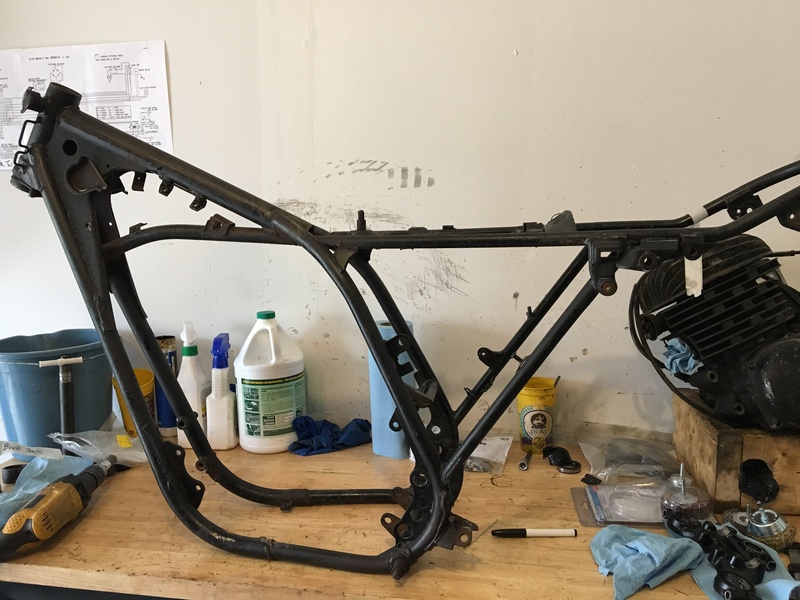 The frame needs some work. Someone lopped off the kickstand bracket, so I need a new one welded on. Someone from this site a while back offered to do it, so hopefully I can get that done sometime soon. 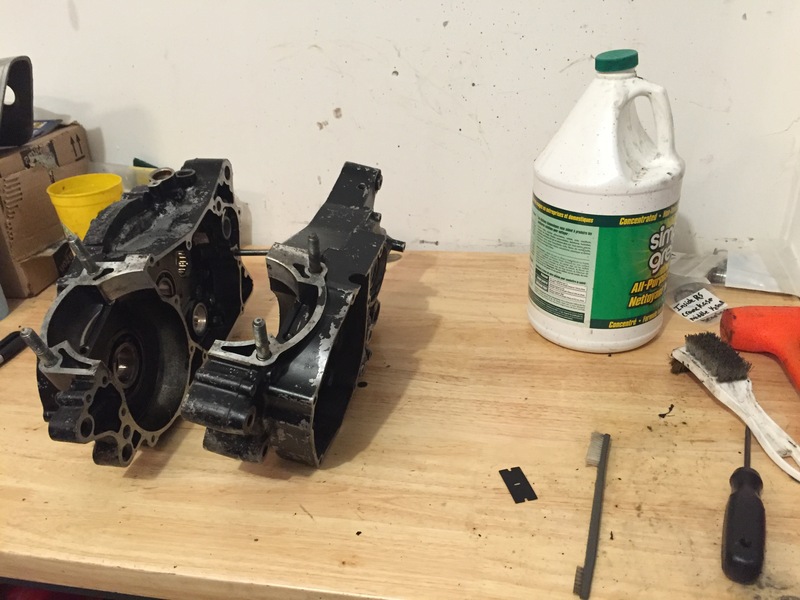 I was worried because the engine mount points looked fairly bent, so I threw the bottom end in there to see. Everything lines up well with the industry standard shove-a-screwdriver-in-there test. I want to make sure the frame is all good and true. After that, I'll probably get it powder coated grey. Awesome find. I don't think I'd wander to far from home on a 70's two stroke when it's finished though. Good luck and keep us updated on the build. My dad had a 76 dt400 brand new in 77. 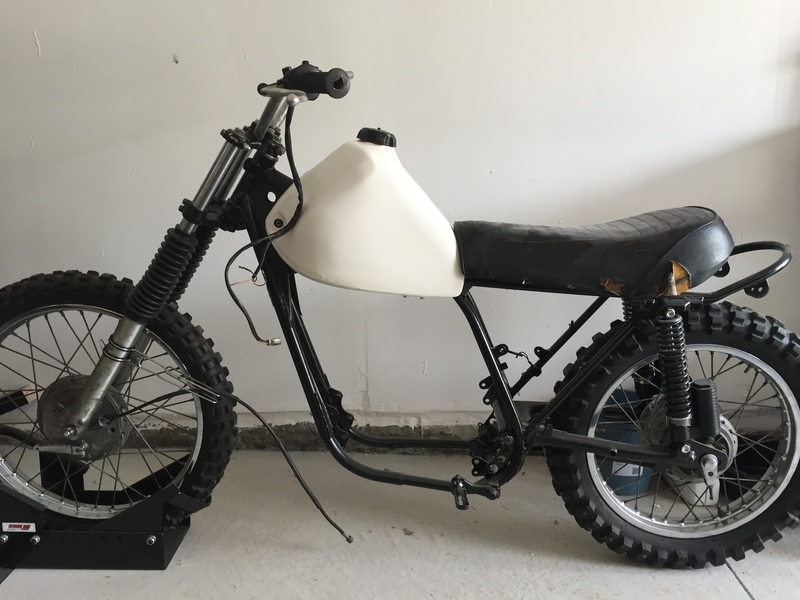 Was a great bike, he kept it until around 87, never opened up the motor once. But he did use it for dual sporting etc, never went cross country lol. I bought it with no ownership, but successfully went through the process at ServiceOntario and the bike is now registered in my name. Interestingly enough, the only registered owner of the bike seems to be a civil engineer from England who worked on the CN Tower in some capacity (from his obituary), as well as all over Canada. 1. Buy the bike, get a bill of sale with the price and seller's info and signature. 4. 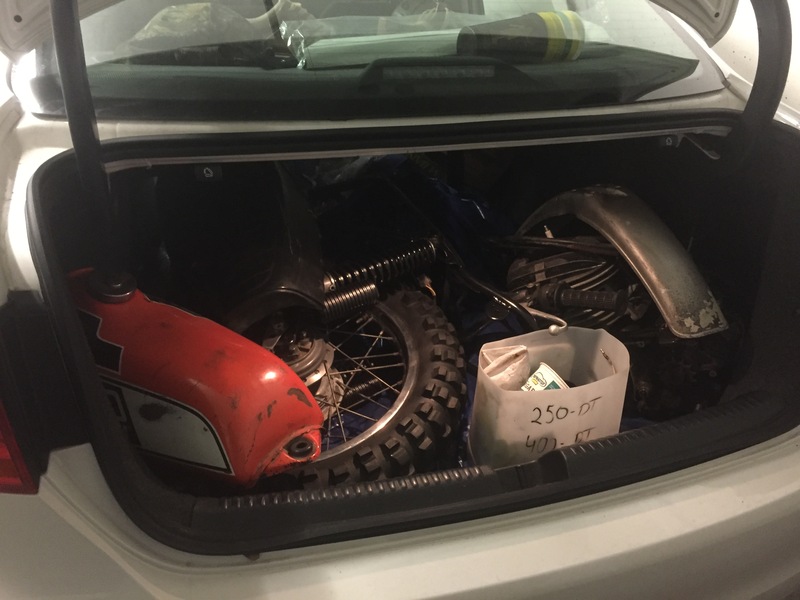 Write an affidavit with the bike's information, declaring that you are the legal and rightful owner. Explain how you got the bike, and from who. Explain why you are buying with no ownership. Explain the steps you took to find the rightful owner (from the UVIP). The more detail you have about what you did, the better. They want to see every step you took to try to find the registered owner. On mine, I explained how I found the obituary, and was unsuccessful at finding contact information for the family. 5. Take the affidavit to the Commissioner of Oaths with the municipality (I did this in Newmarket). You can also use a notary, but that's more expensive. Have them sign the document, it was $17 for me. 6. Take the affidavit and bill of sale to a ServiceOntario and get the bike in your name. The first one I went to (Newmarket) looked at me like I was insane, and said I had to find the last owner and that they couldn't help me. I immediately went to Bradford, and they knew exactly what to do there. I think the more rural the ServiceOntario, the better. Both frames are at CMR Racing in Trenton, where Denis and Byron have agreed to go over them and make sure all is well. I'm very gracious they agreed to do this! They will also be fixing some minor issues with them, bringing them back to stock. Both have been butchered in some capacity. I suspect the new (to me) frame is slightly bent at one of the rear shocks, which was my reason for contacting them in the first place. While I wait for the frames, I am trying to get the other stuff done. 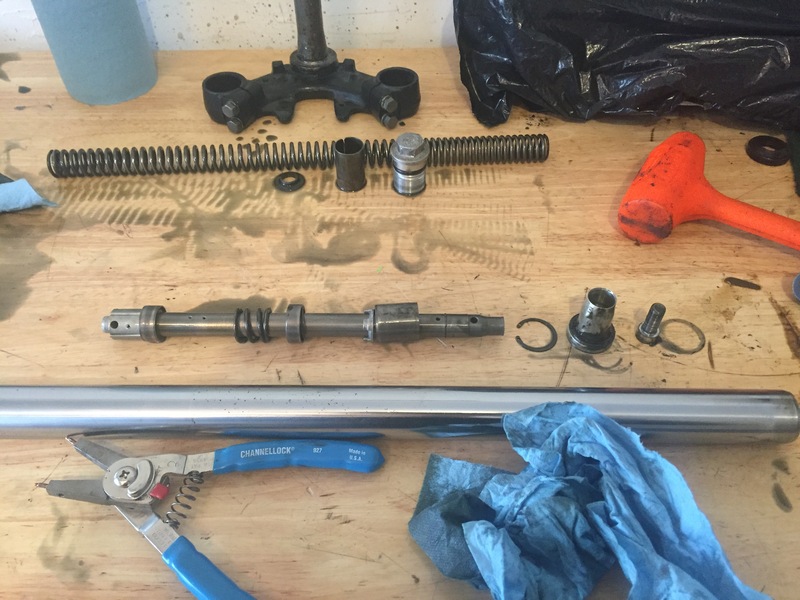 Today was my first time taking apart front forks. I am going to disassemble them completely, get the forks tubes re-chromed, then put them together with new fork seals and dust caps. I finished disassembling 2 of the 4 today, for the other 2 I need a special tool to remove the dampening assembly bolt on the bottom. All 4 caps are off, the tubes are drained and the springs and such are removed though. 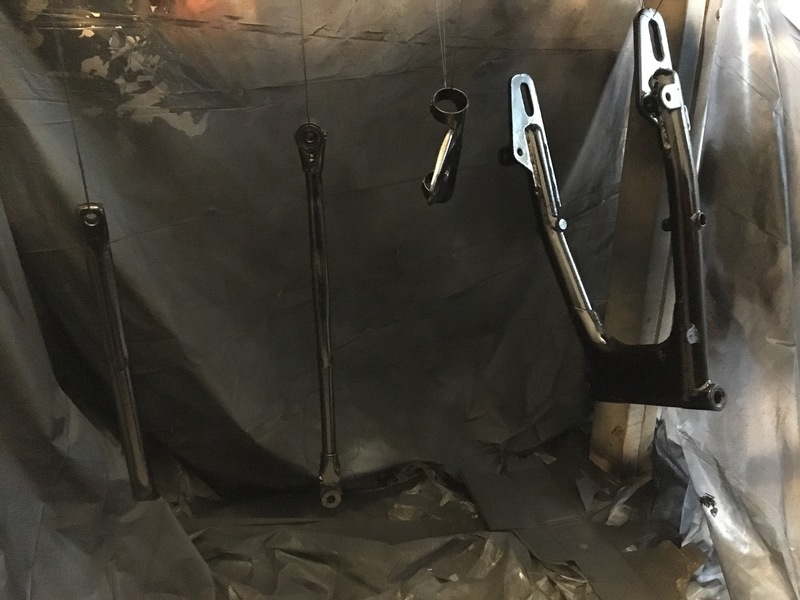 When I get that tool (should be here Wednesday), I'll take the dampening assembly out of the other 2 and pop out the fork seals. 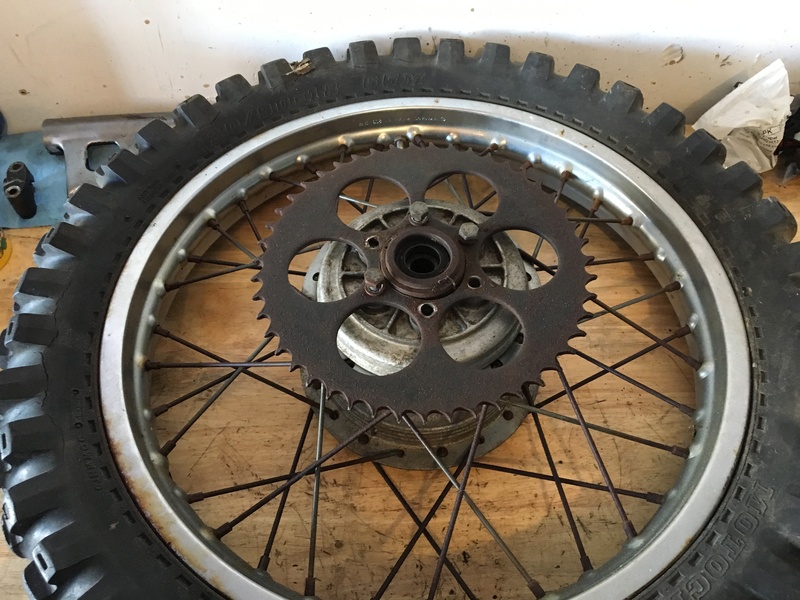 The Yamaha method of removing fork seals had me pry them out with a screwdriver (says the service manual for this bike), it made me a little uncomfortable but both seals came out and I didn't harm the tube (I think). 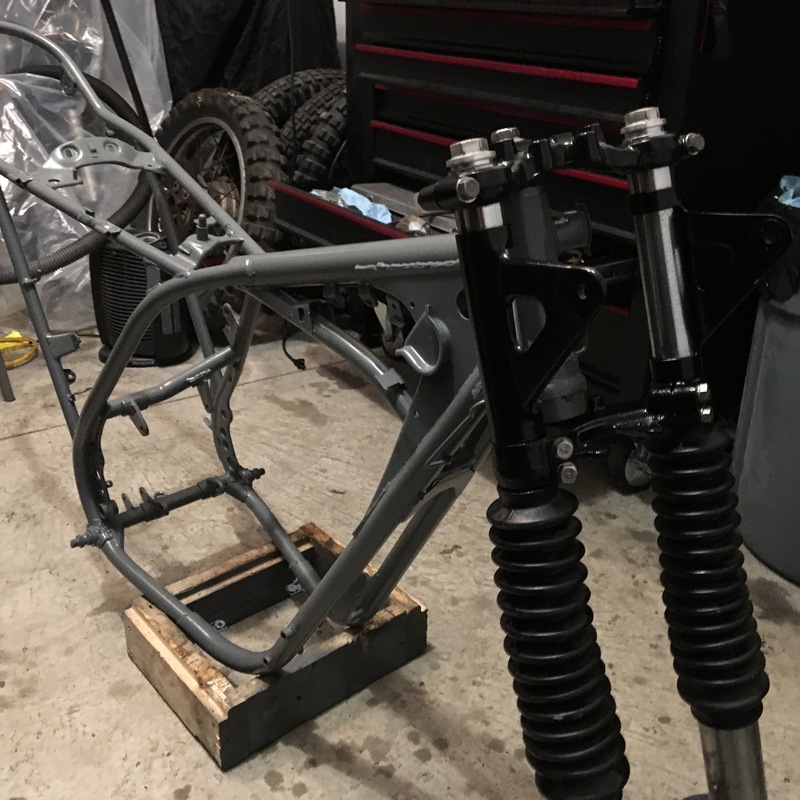 After I put these back together, I'll probably focus on the wheels, I want to get them cleaned up and ready to put back on the bike so I can get a rolling chassis ASAP. I'm also experimenting with spray painting, first time doing that as well. I am **** at it though. 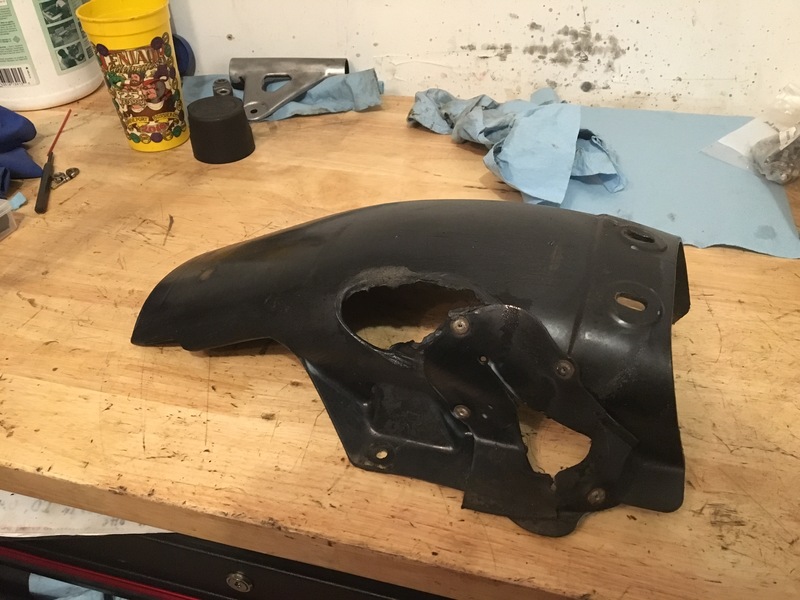 I tested out on 2 parts, 1 plastic (headlight bucket for CT90) and one metal (center stand for CT90). The plastic one turned out extra ****, the paint didn't bond well to it. The metal one was alright for Ray Charles. The paint is bonded well (I think) but it won't win me any concourse events. I'm OK with that though, I just want something that will protect the metal and hold up. 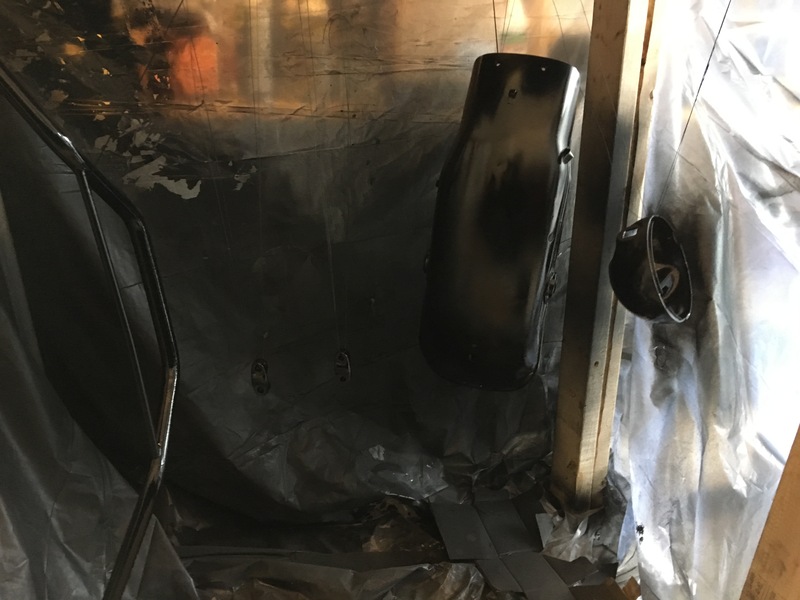 For the tanks, I'll probably get those powder coated. I'm ok spraying the small insignificant metal parts myself. 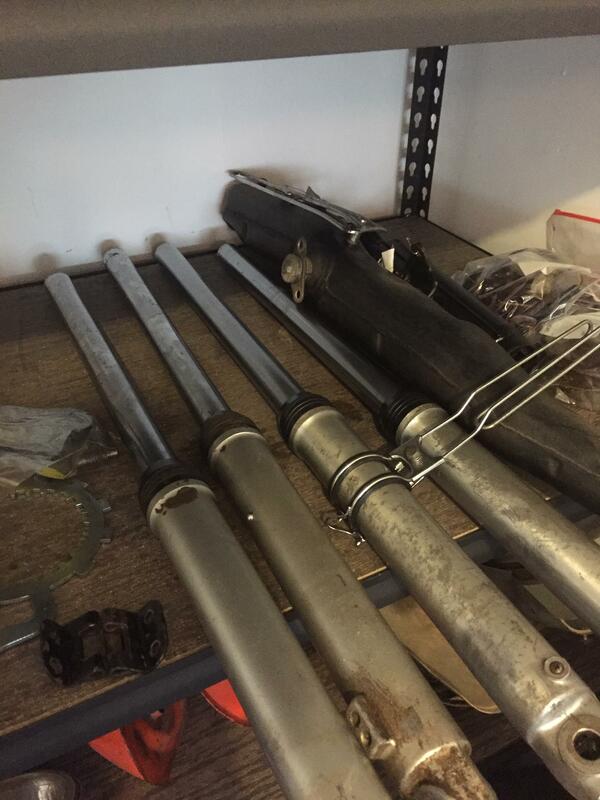 Got a quote for 225$ a pop for the fork tubes, which is a little rich for my blood given that its mostly cosmetic. 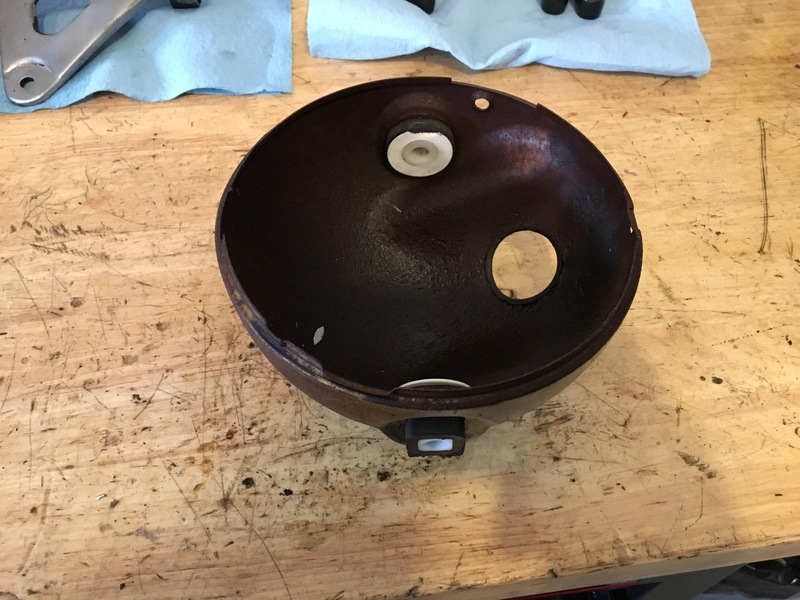 So I did what I could with a scotch brite pad and WD40 to smooth out the pitting. 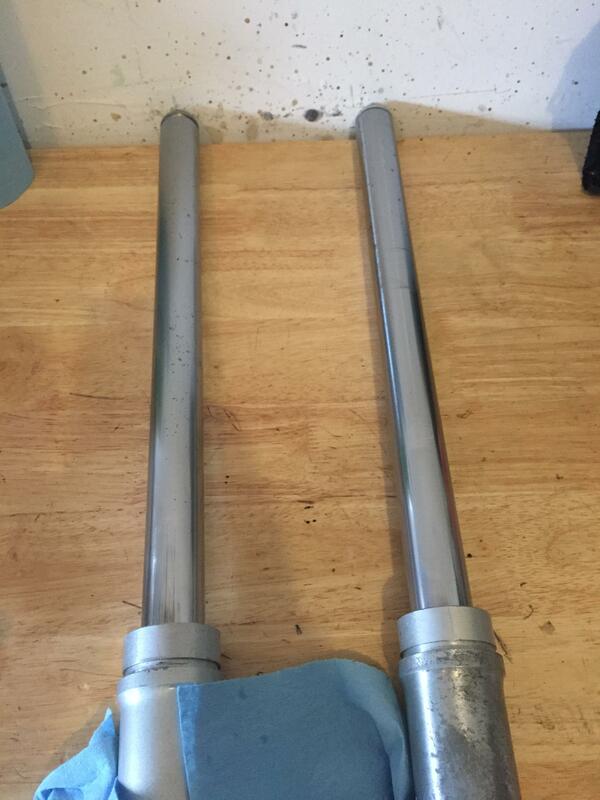 Then I assembled the right tubes for both bikes (still waiting on my tool for the left). 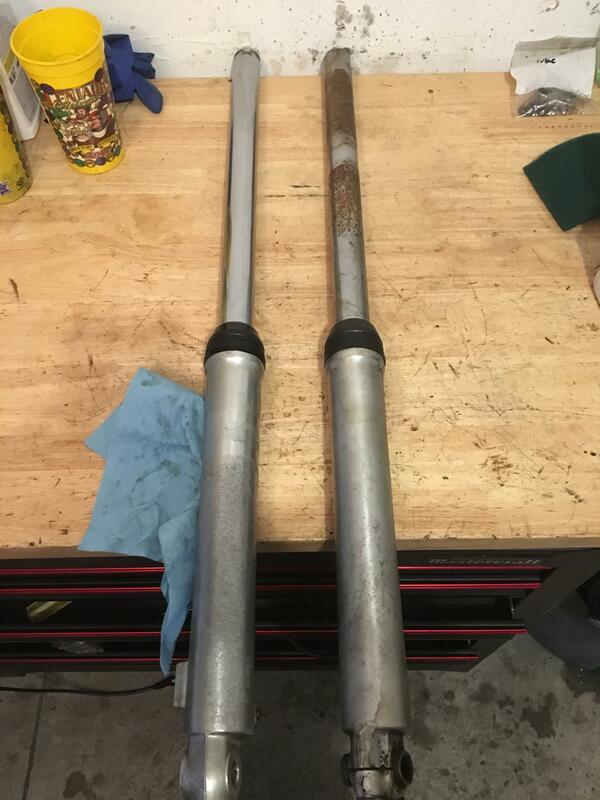 The tube on the left is from the 2nd bike, in worse condition than the first. The pitting is very minor, so for now I'll keep an eye on it and perhaps re-chrome down the line. 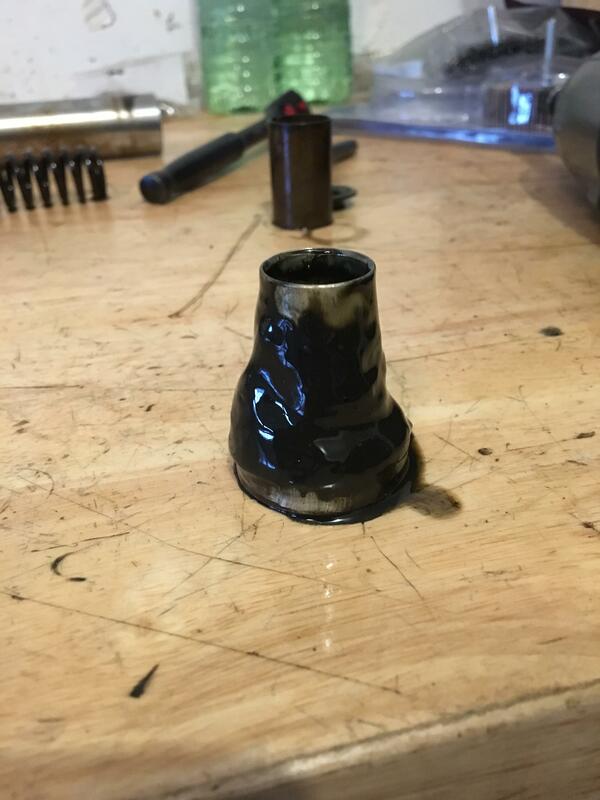 Autosol is your friend for cleaning up pitted fork tubes. It's obviously not magic, but it does clean them up as well as possible with very minimal effort. 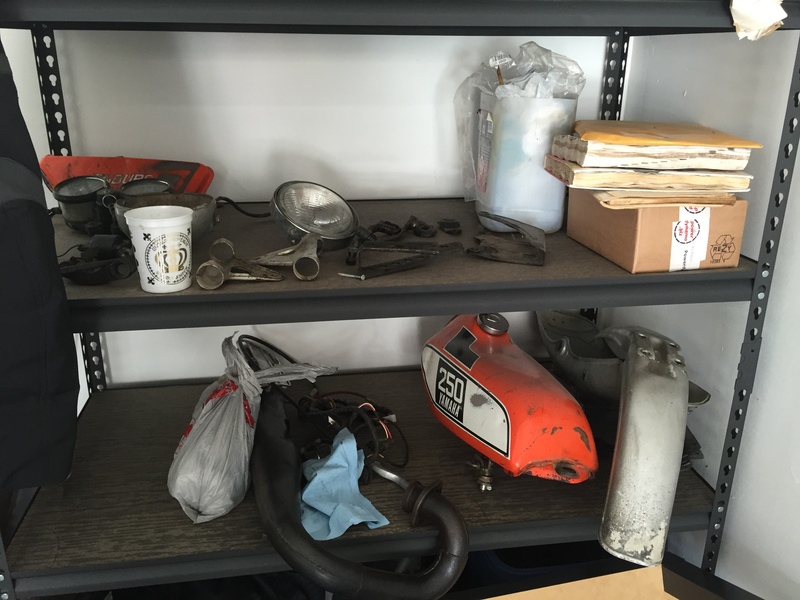 If you think Autosol is good you'll flip when you try Mother Mag & Aluminum polish - simply no comparison. The DT stuff has been going slowly because the CT90 has been taking up a lot of my garage time. But as that winds down, I'll be ramping up work on these bikes. My DT part's department keeps growing. 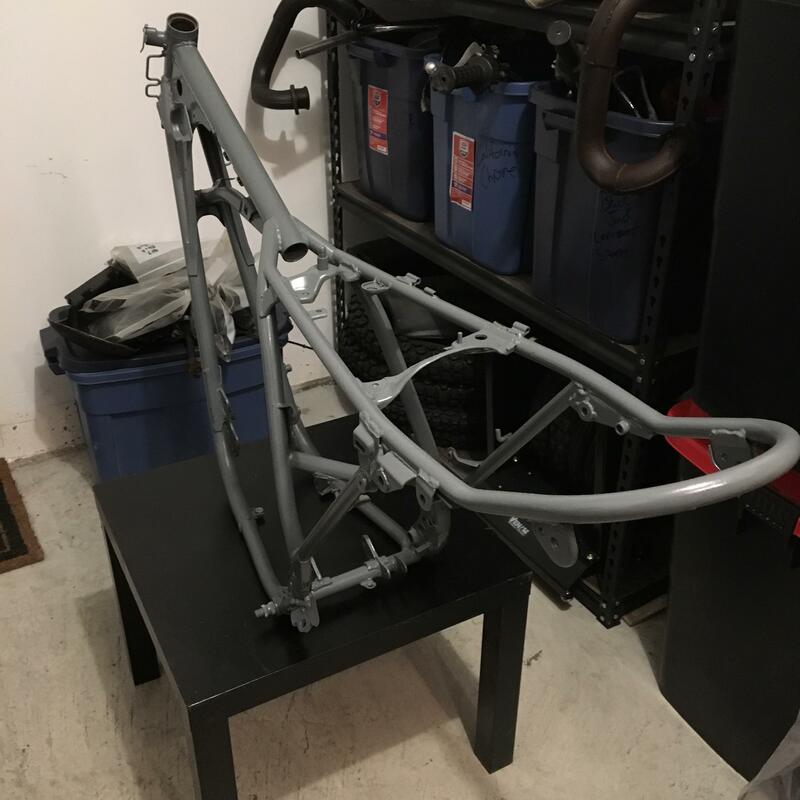 I now have 2 MORE frames, both '76 DT250. The guy sold a boat load of parts with both. Both are registered in my name, but as offroad vehicles. 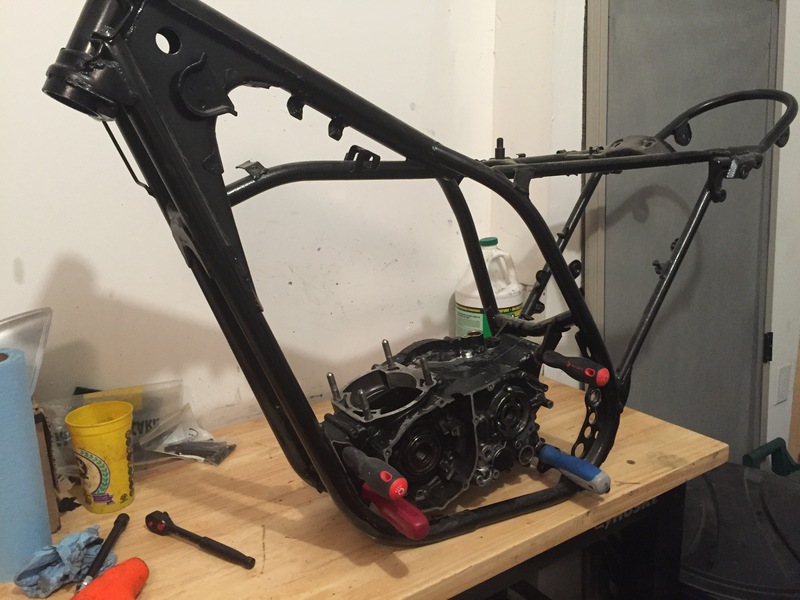 Both are stripped right down to the nut and bolts. No engines with either. I might build them up into road bikes eventually. Right now I'm moving through parts cleaning them up and painting. I'm just gonna work through the lot and restore as much as I can. Today I was working on the lower triple for my 2nd DT400. I committed a faux pas and didn't take a "before" picture. But it was not good at all. 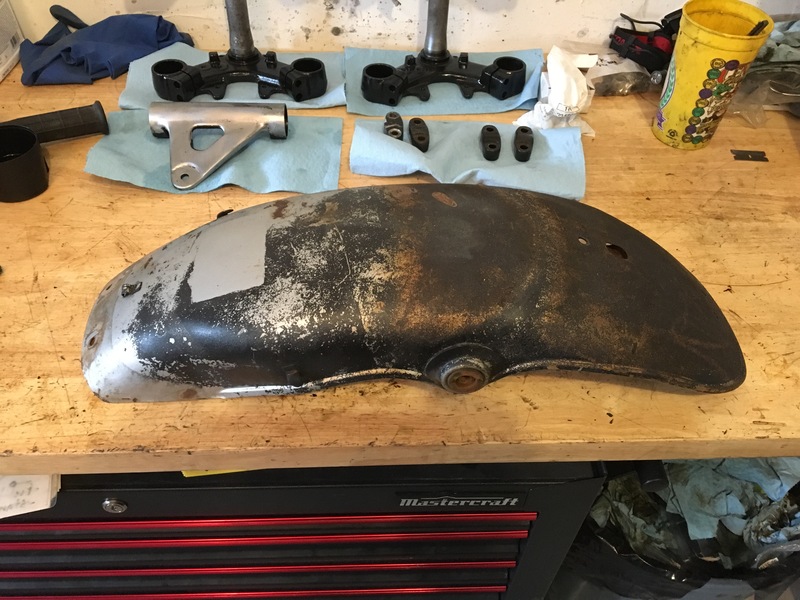 I spent a while with a wire wheel and my drill to strip as much rust and paint off as I could, then I finished up with sanding. 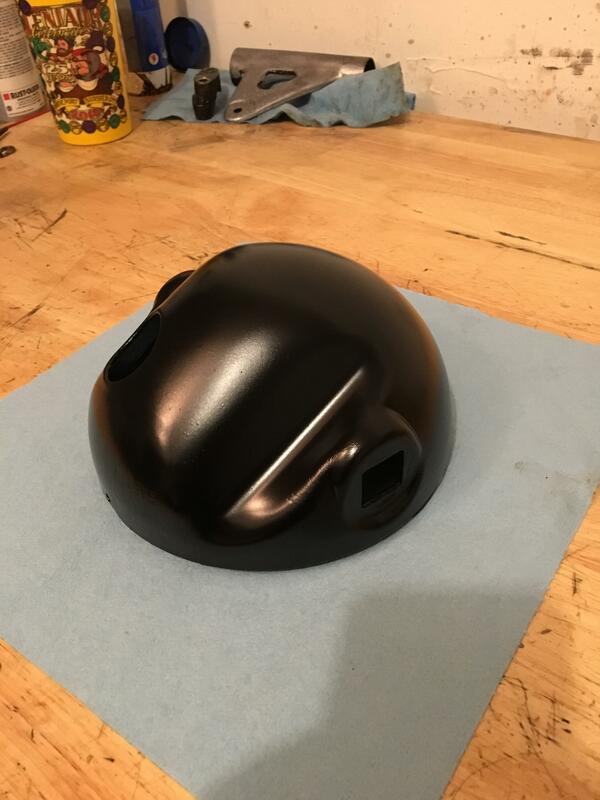 Then 3 coats of Krylon Rust Protector primer and 3 coats of that Krylon in semi-gloss black. I'm hoping this paint turns out to be up to the task. Part of why I'm doing small stuff is to test and gain some knowledge... before I do the frames. I have 4 frames I'd like to paint. 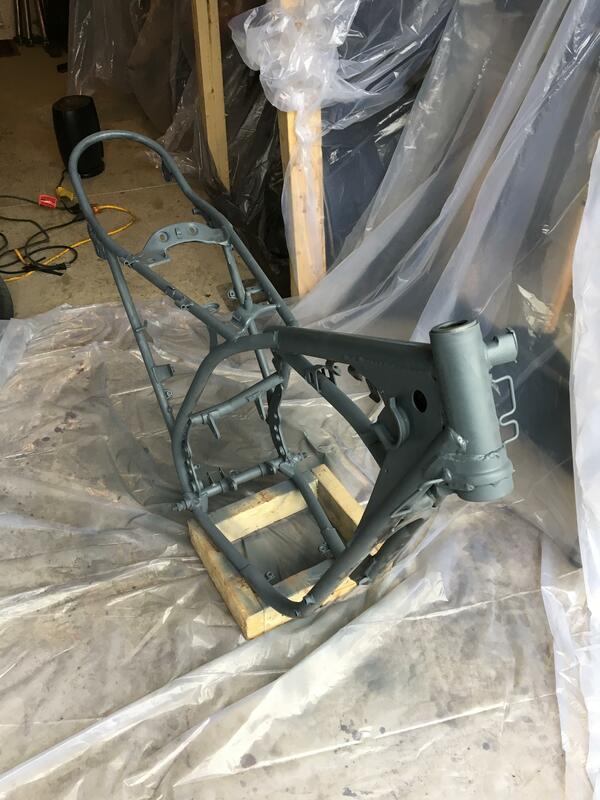 I decided to paint one of my extra frames today, now that me and some others managed to remove the frozen swing arm bolt (it was frozen on both frames, took us more than an hour to hammer them out). This frame wasn't too bad, some light rust and an old wasp nest in the down tube. Gotta love restoring forsaken bikes. The sister frame has a wasp nest in the same location too. 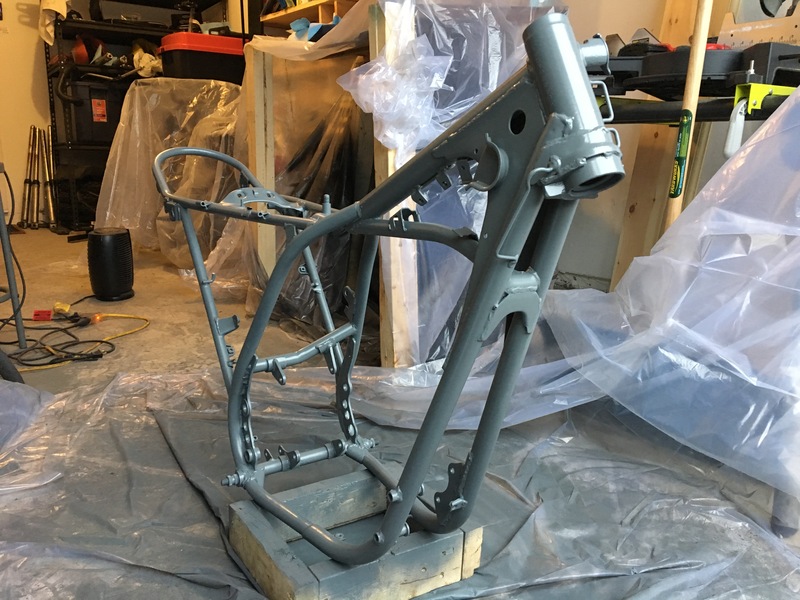 Next up, 3(ish) coats of Kryon Rust Protector primer. I'd start on one end, and work my way along. Then I'd go to the beginning and go again. Repeated once more. Let that dry to the touch (15 mins or so) then flipped it to get the rest. I'm 100% sure this is the industry standard method Engine building boxes are versatile stands! Then some coats (3ish? maybe) with Krylon Rust Protector gloss enamel. I'm letting it dry then I'll flip it and do the underside hard-to-reach bits tomorrow. It won't win many concourse competitions but I'm fairly happy at how it is turning out. When it dries I'll report back on just how exactly this experiment ended. 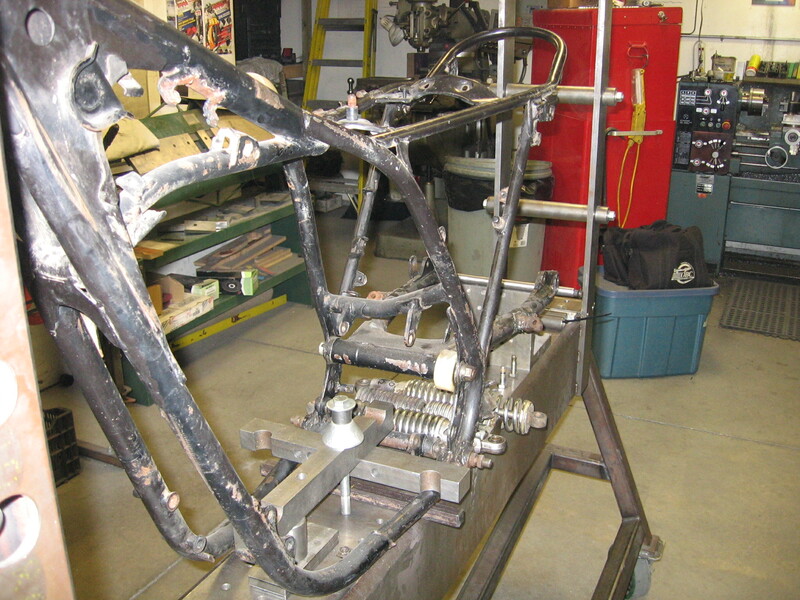 Denis contacted me today, they are working on the frames at CMR Racing. As we suspected, one of the shock mounts from the 2nd frame is off. 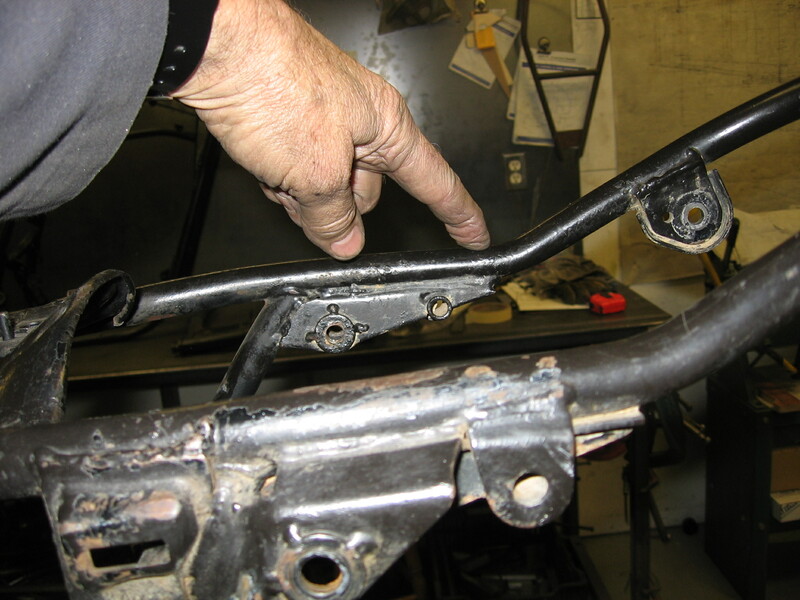 They'll try to get it back into good form, and do a few odd jobs to bring both frames back to stock spec. 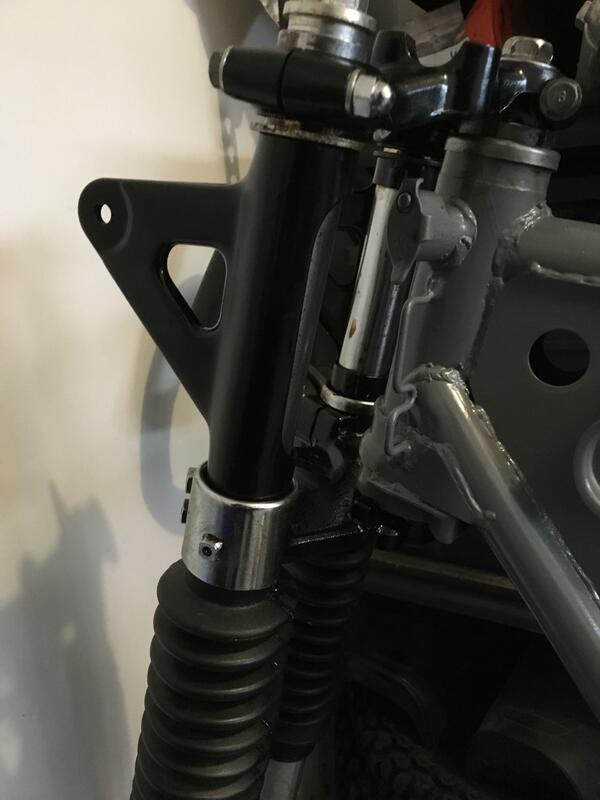 ... somehow there has been an impact which does not show on the frame until you look closely, but has pushed the right rear upper sub-frame down (behind the top shock mount) and the shock mount itself in (by 3.8mm) and forward (by 3.2mm). 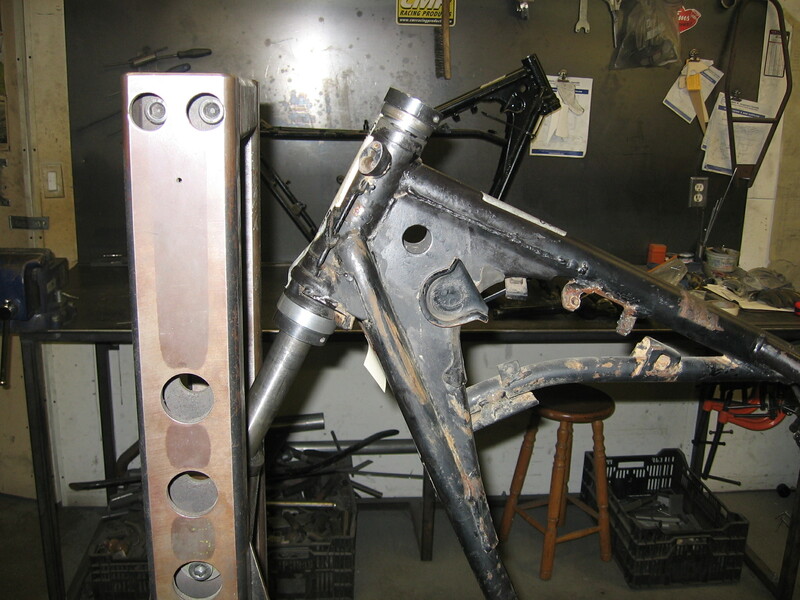 Here are pics of the frame on our frame assembly jig. 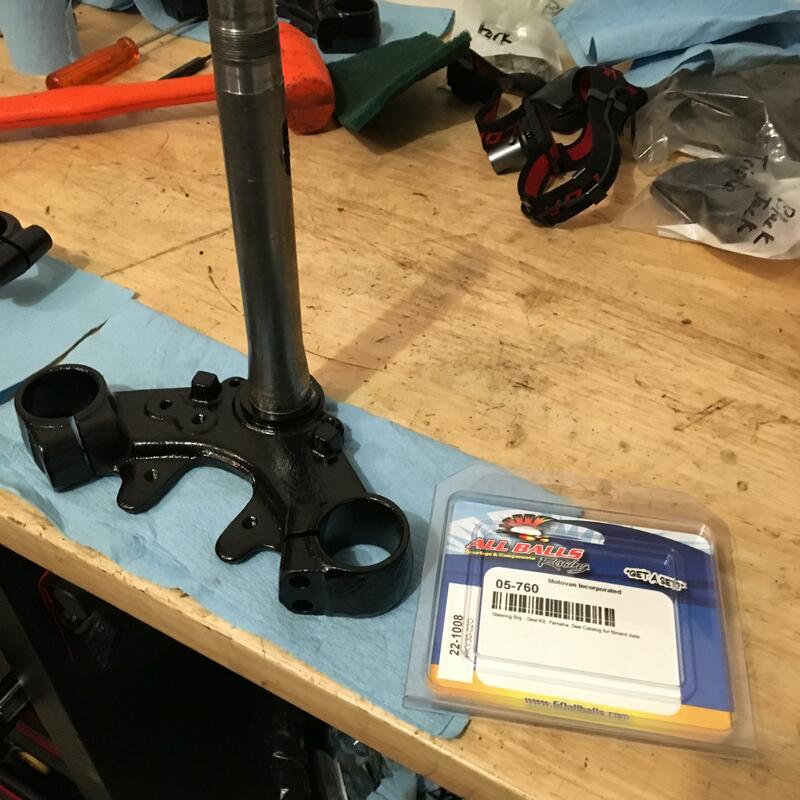 We made up new adaptors to fit the frame to our jig, then checked the alignment of the steering head to the swing arm pivot axle on each side of the frame, then checked the rear swing arm axle location slots for being concentric with the center-lines of our jig and your frame. We found them to be within acceptable limits (0.5mm). 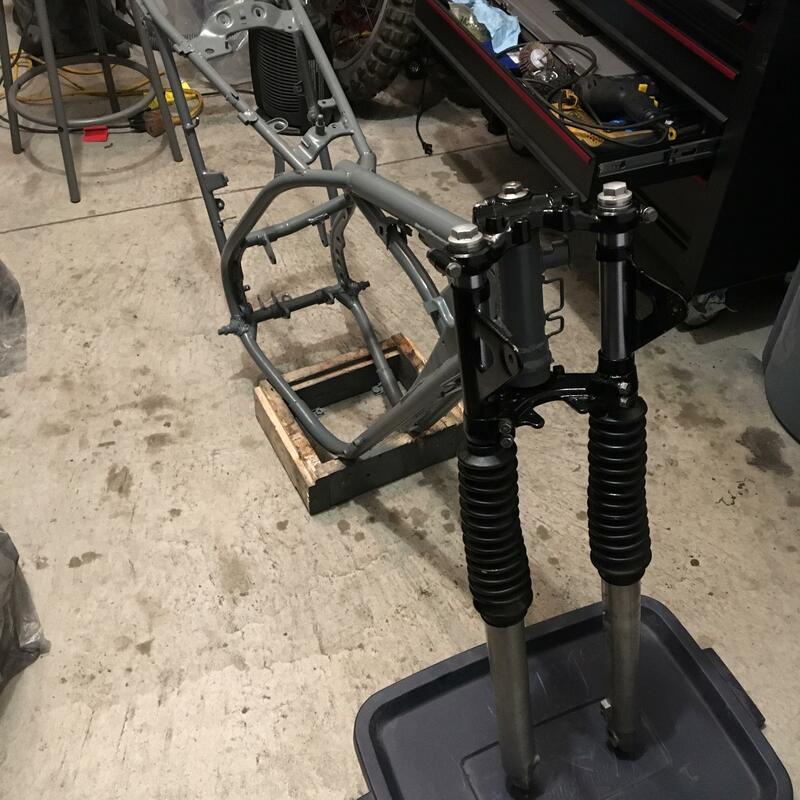 So tomorrow we will use controlled heat and a little pressure to bring the rear sub-frame back and the right top shock mount into it's correct position. 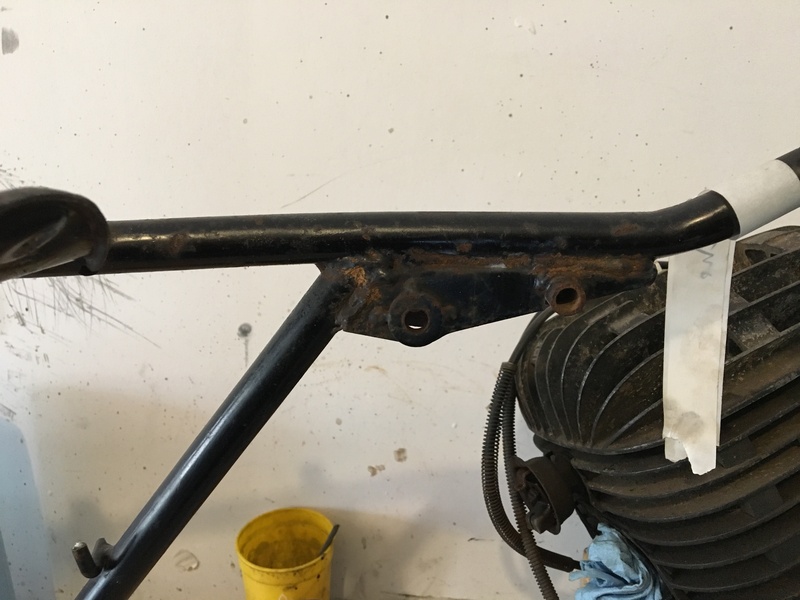 We will also attempt to repair the rear footpeg threaded bosses in the swing-arm, and repair the threads on the swing arm pivot axle, so the #2 frame might well be completed tomorrow. 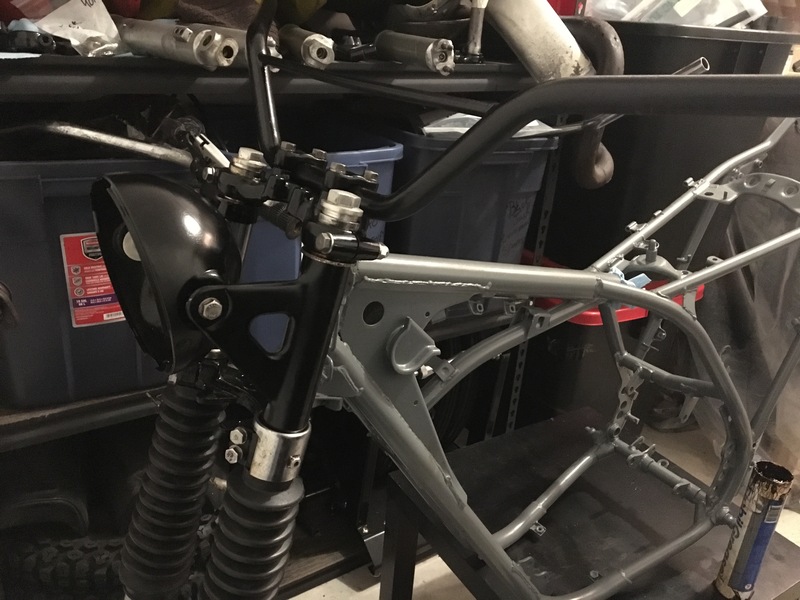 On Monday we will check your #1 frame for alignment, then repair the rear stand mount and look at the stand leg to improve it's strength or make a new one out of stronger material. Still working my way through, cleaning and painting spare parts. 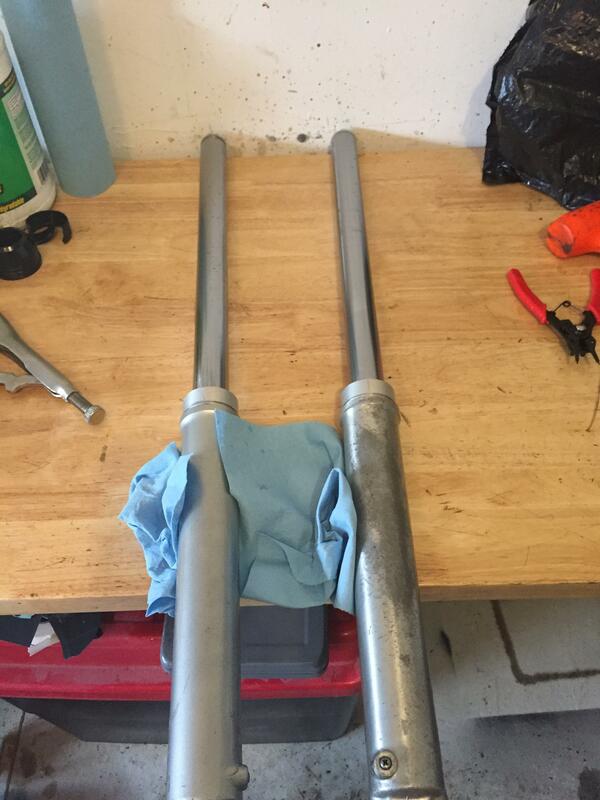 Today I finished a pair of fork tubes which came with one of the rolling chassis. I'll use them with the frame I painted in post #13. I also painted three triples, upper and lower. All fork ears are painted. So, I have 3 front ends ready to go. 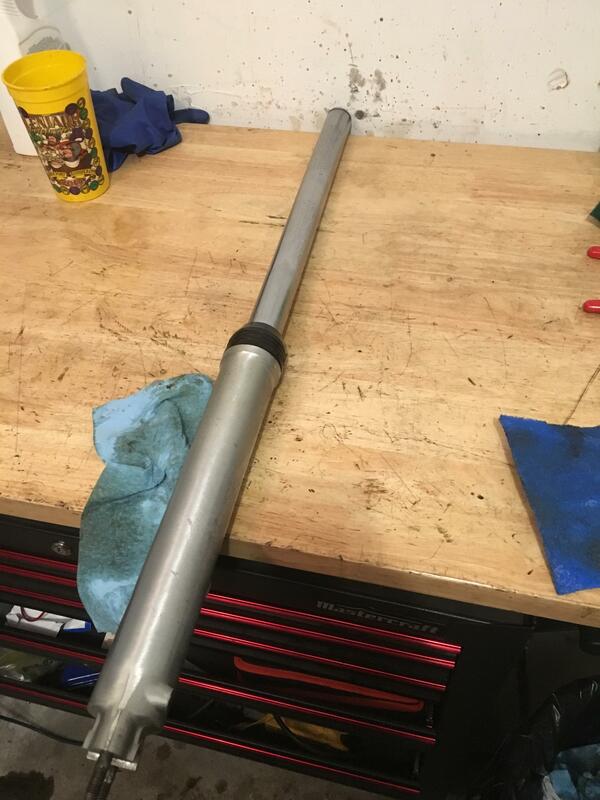 The fork tubes I did today were awful, I'd be willing to bet the last person to go in there was at the Yamaha factory. These ones smelled like wet cat food inside and had an inch of sludge at the bottom. The tubes were both rusted. I stripped both tubes down, cleaned everything and reassembled with new fork seals. I cleaned the rust with blue Scotchbrite and Simple Green. It worked out pretty well. They both looked like the one on the right. This is after I finished the left one. The right tube from the previous picture, all cleaned up. 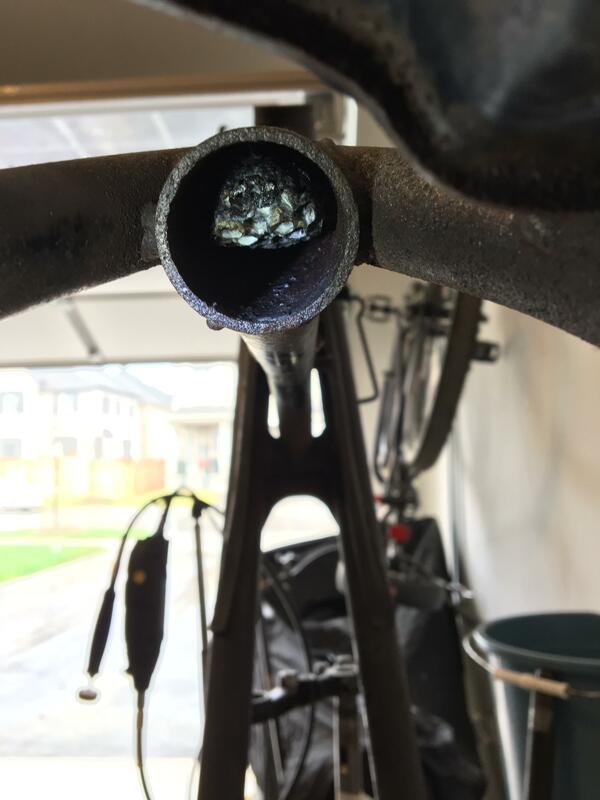 What was sitting in the bottom of the fork tube... it was the same for both tubes. 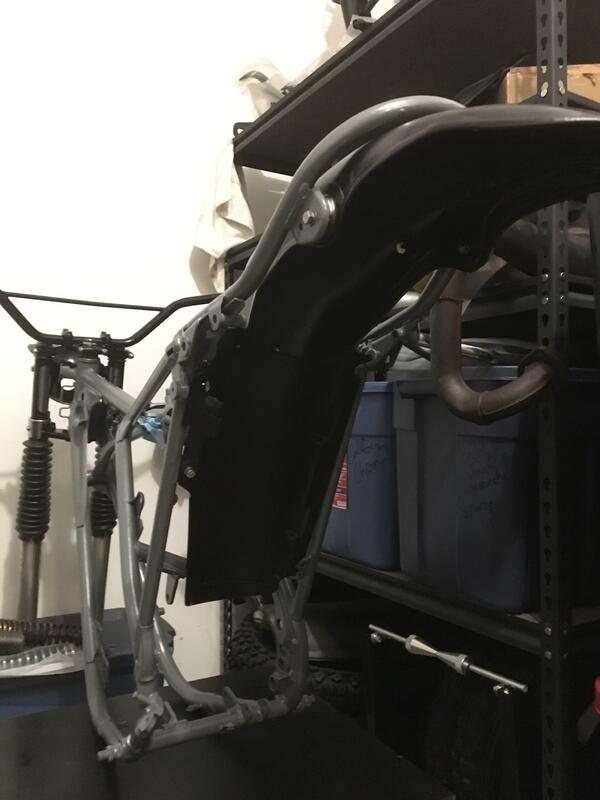 I started work on the rear shocks, but hit a number of walls. 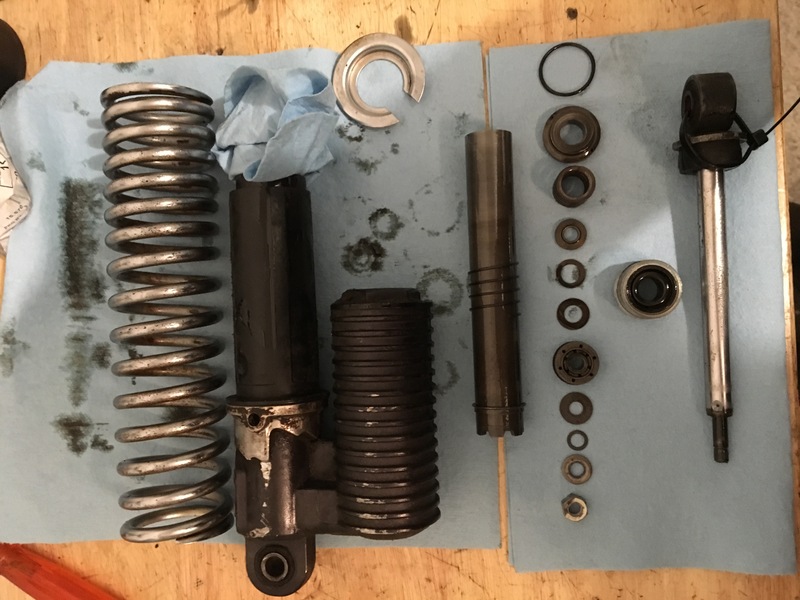 All I managed to accomplish was removing one spring and cleaning it. I think it is cleaning up fairly nice, compared to what it was. This was, again, scotchbrite and Simple Green. You can see the left shock is broken, down at the bottom of the spring. This is a set back. I'm not sure what I'm gonna do about it yet. After I got that together, I refocused my attention on the rear shock from yesterday. I managed to get it all disassembled. 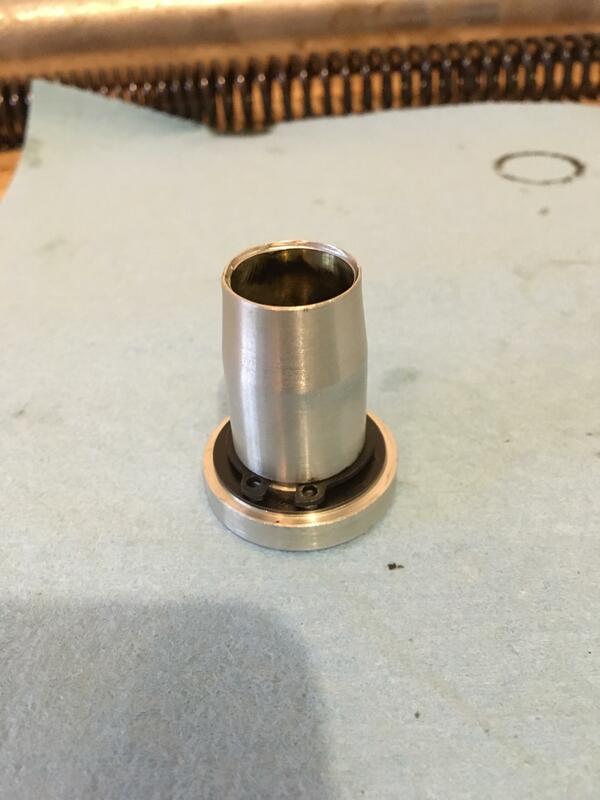 Singles seals work just fine in the seal heads but you have machine a spacer to hold in a single seal ( more work). The original seal was 15mm tall, 23 mm od and 12mm id and is not avaidable. I use 2 24mm od 7.5mm tall stacked. 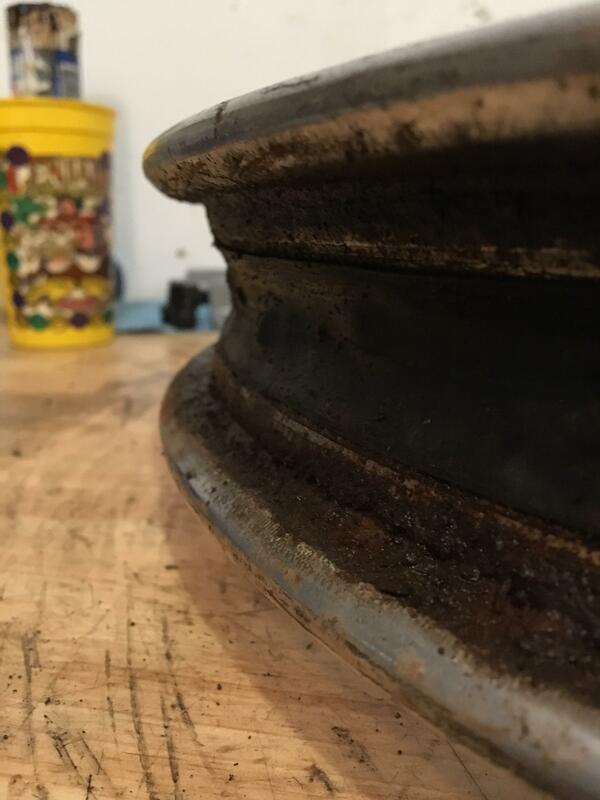 Maching out to 24mm is a piece of cake and the double seals insure no leaks. 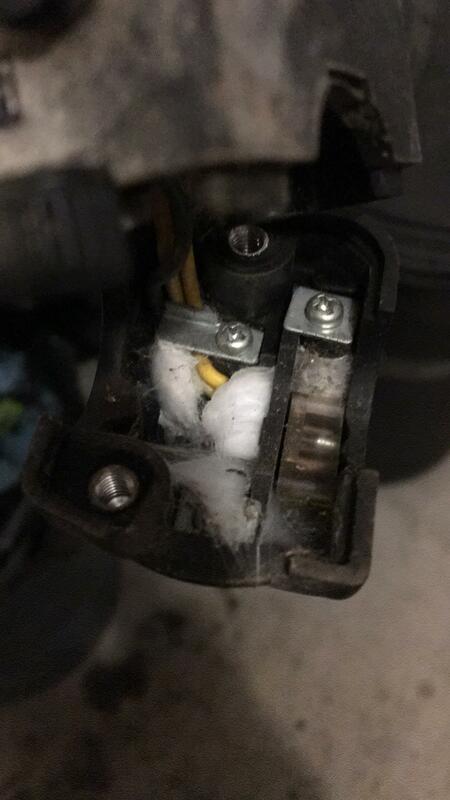 As for the broken piece on the other shock, I ordered a set of thermal flows off of ebay for 25$ USD so I'll salvage them for parts and we should be good! Lastly, I tried to find a set of handlebars to go on this thing. 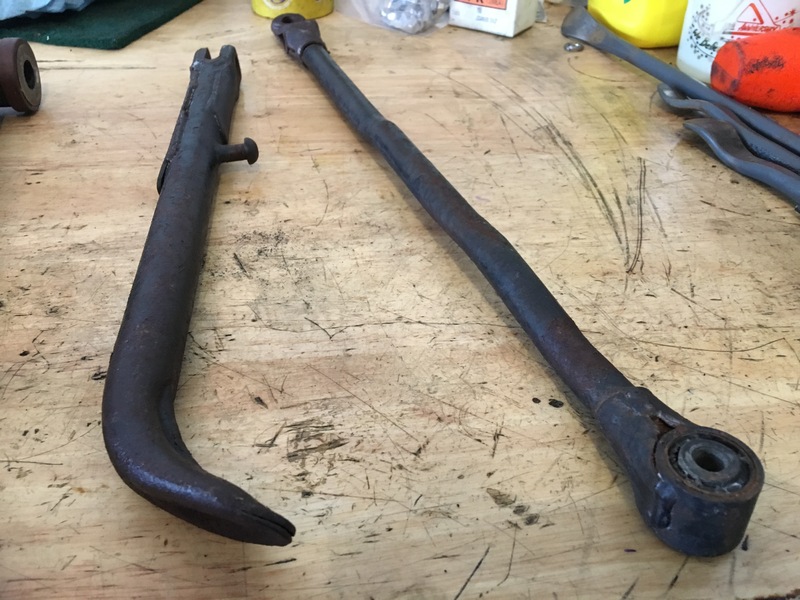 I have 3 sets of original handlebars. The first (and only) one I looked at today were bent like crazy. Probably off by a solid inch. I'm sure one of the other two sets will be more agreeable. 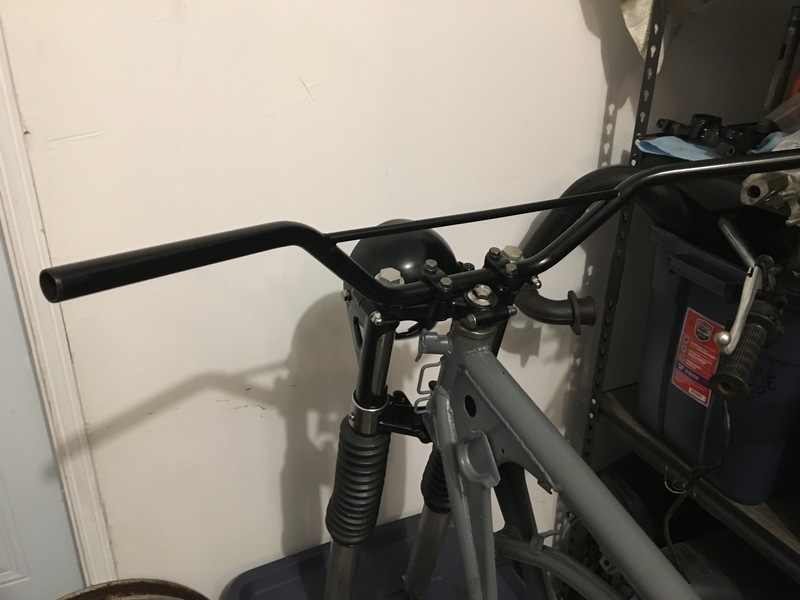 I have 2 sets of Renthal High bars (613) for the other two bikes. 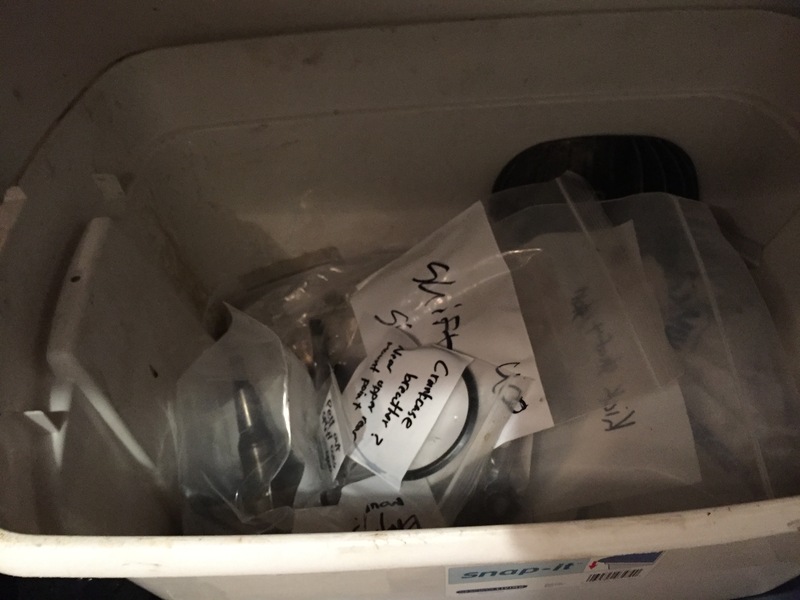 I just found oil seals that are 12mm ID, 23mm OD, and 7 and 8mm thick. So one of each of those should fit in the shock without machining. I'll give that a go first. The seals are from avxseals.com, I have no idea who they are but for 1.50$ a pop I'll take a risk. 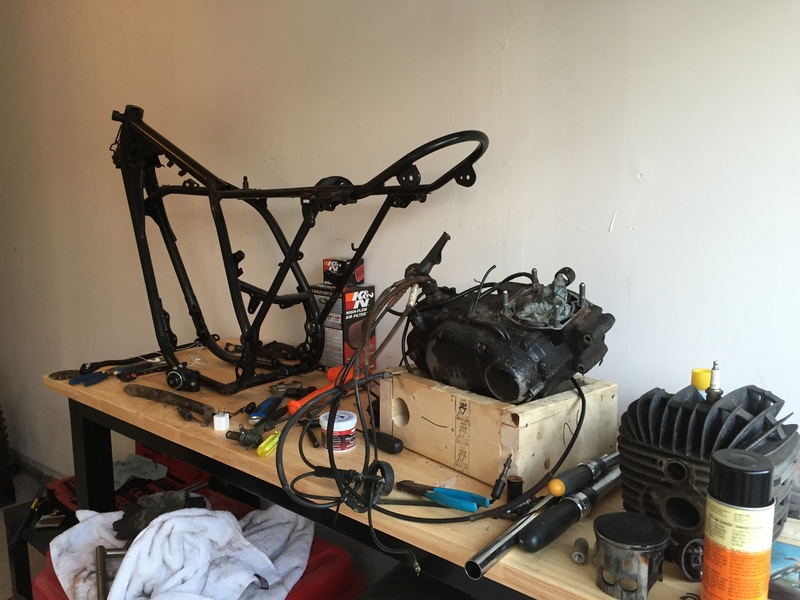 What I'm liking about this build is I'm learning what to expect for the next two bikes, so they should go smoother. Now if I could only find the reflectors! 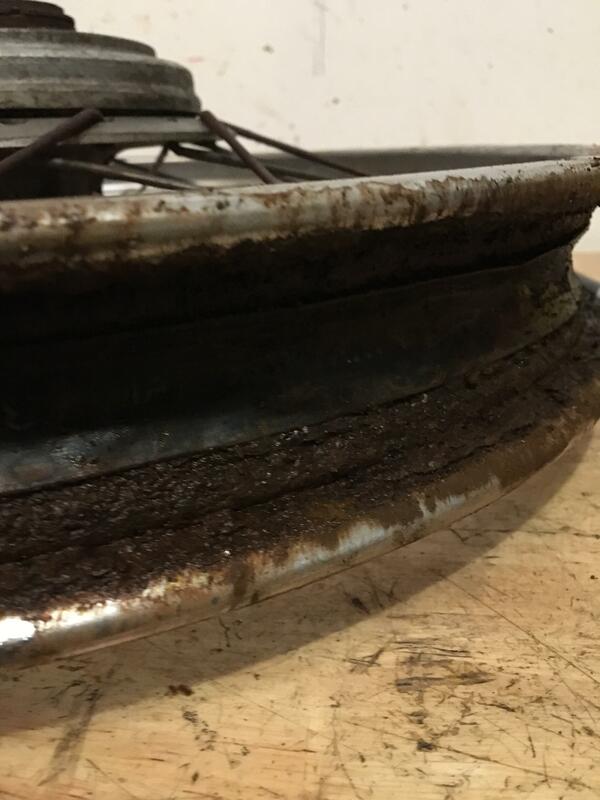 The brown on the metal isn't rust, it's grease. I'm not sure how long this bike will sit so I'm not taking chances with rust. 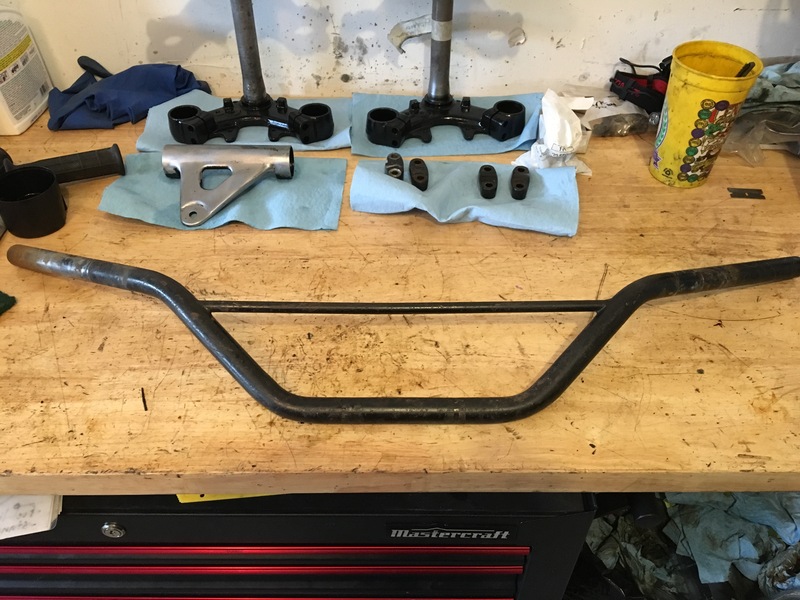 I found a set of decent handlebars for this bike. They aren't really bent out of shape, but they aren't exactly showroom fresh either. 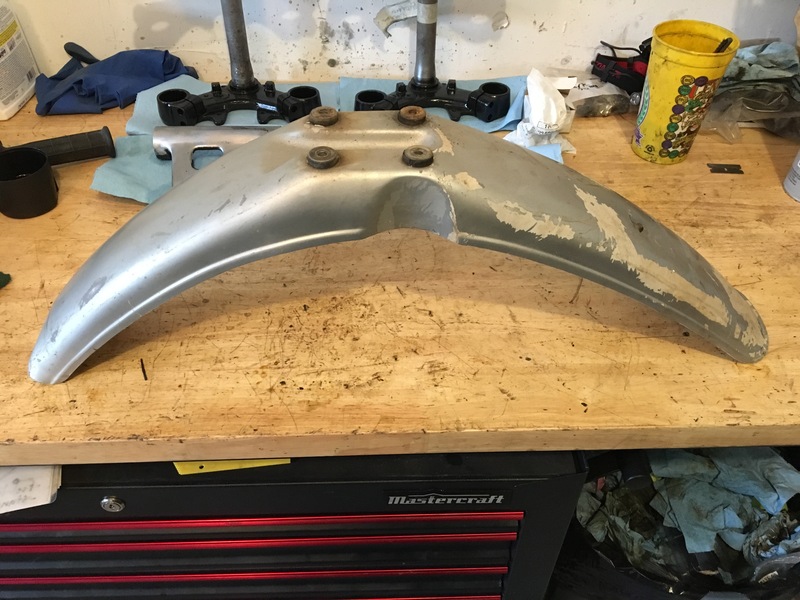 Rear fender. This is one of four I have, each frame came with one. Front fender. I have 3 of these. I don't have a good history painting plastic so this one worries me. I think a brand new one is like 25$ so if I botch this, I might go that route. A headlight bucket. 1 of 3 or 4 I have. Not pretty, inside or out. 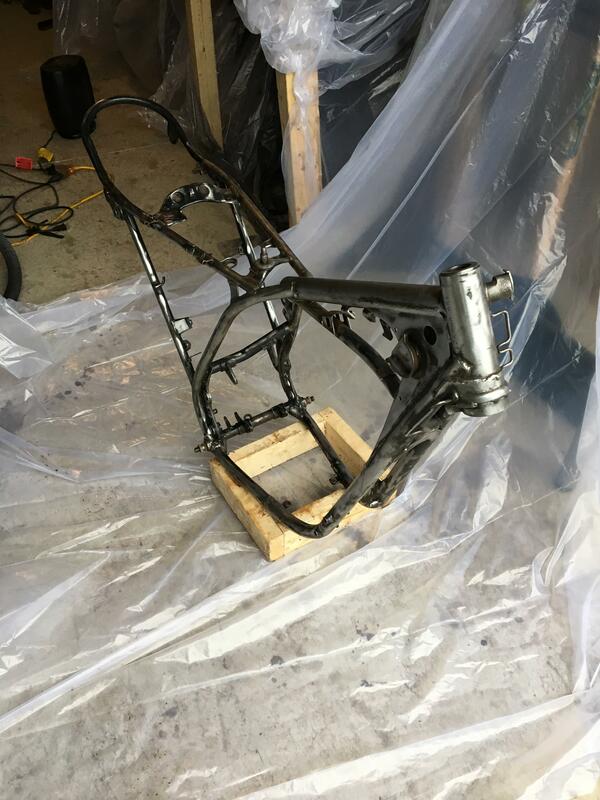 Painting the handlebars, 2 handlebar clamps, rear fender and headlight bucket today. Hopefully they come out decent. I am still rather inexperienced with painting, and I'm the king of over spray. I need to keep telling myself to get the can farther from the part. - Where does the battery go??? I may need to find, clean and repaint some sort of battery tray? 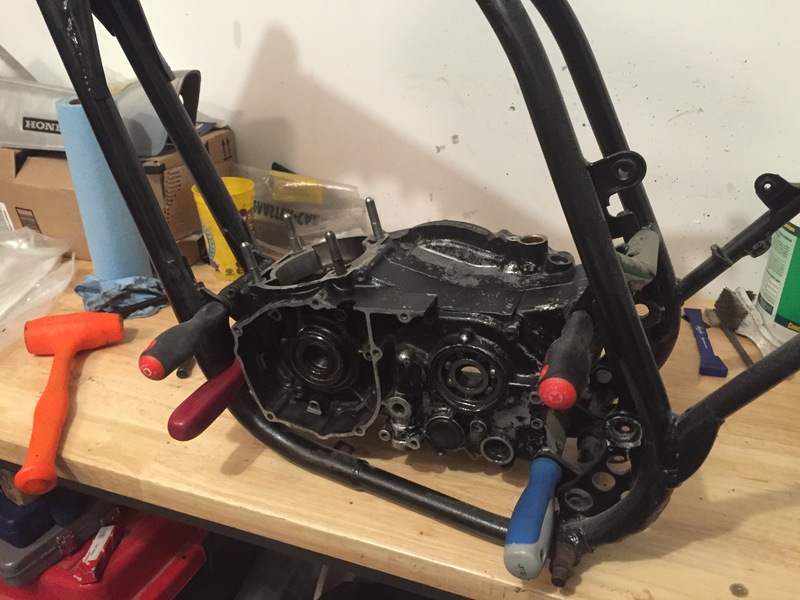 - Should I use my only engine bash plate on this build? For some reason, out of all 4 bikes I have, only one came with a bash plate. Today started with removing old tires. I have 3 sets of rims, so the worst set are designated for this rolling chassis build. This 'using the worst' has really taught me that even some terrible looking stuff can turn out great with some care. My plan is to remove the old rubber, clean the rims as best I can, hopefully getting them to shine. 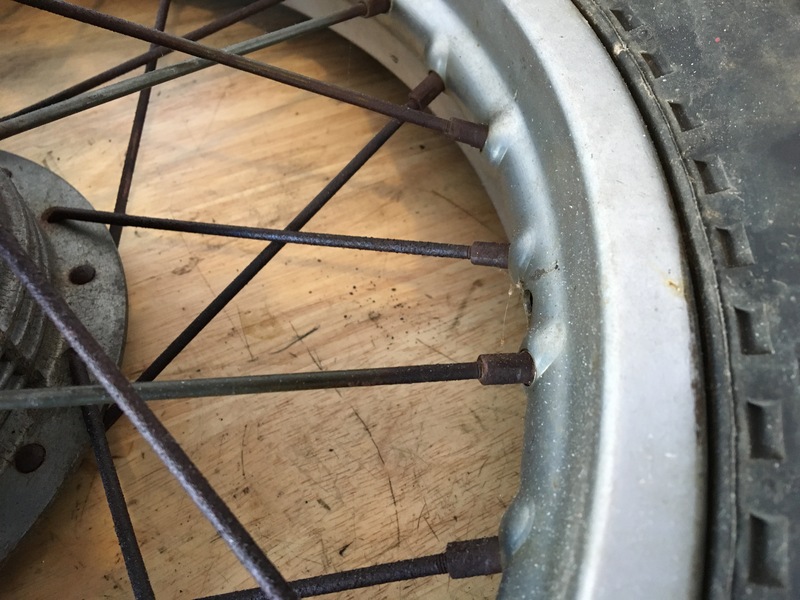 Then I'll spray the outside of the rim (under the rubber) with Tremclad to stop the rust from advancing. New rim tape, and new tires and tubes then. Hopefully then I have shiny rims that aren't rotting away on me. 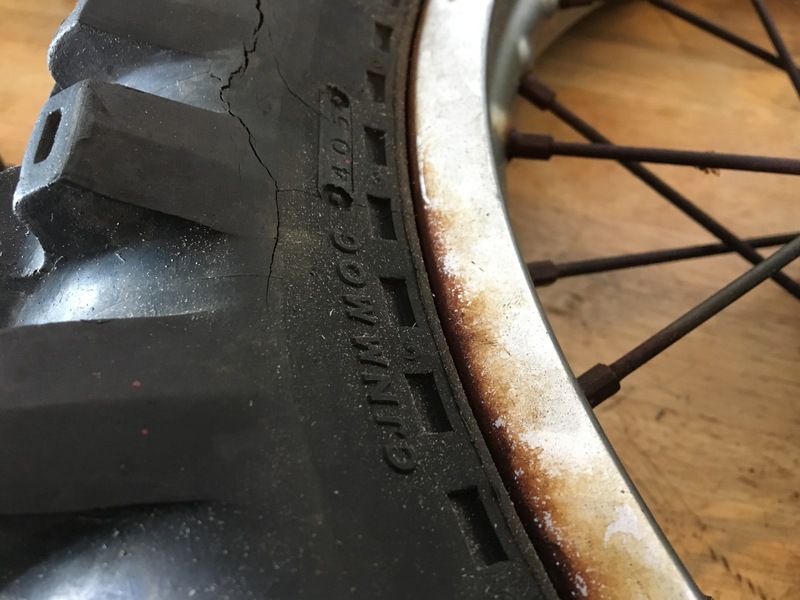 The candidate rear tire. 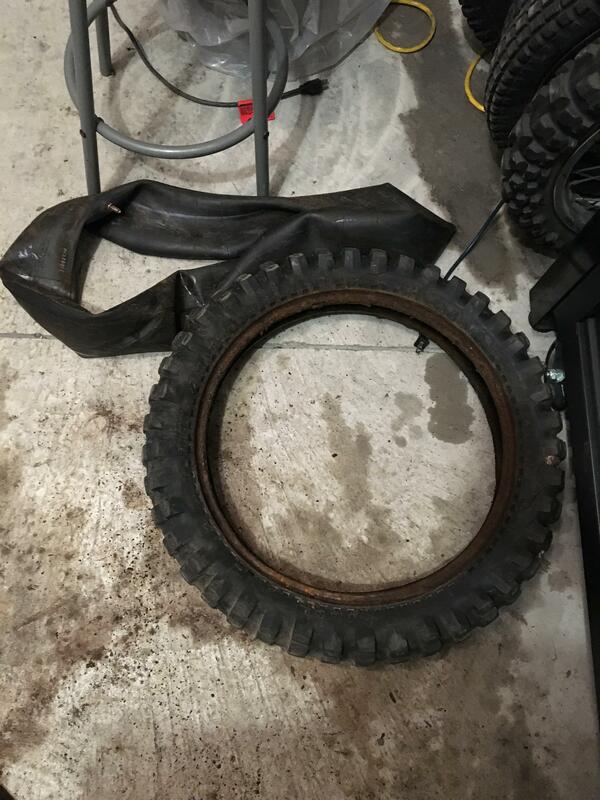 Time for that old rubber to go. 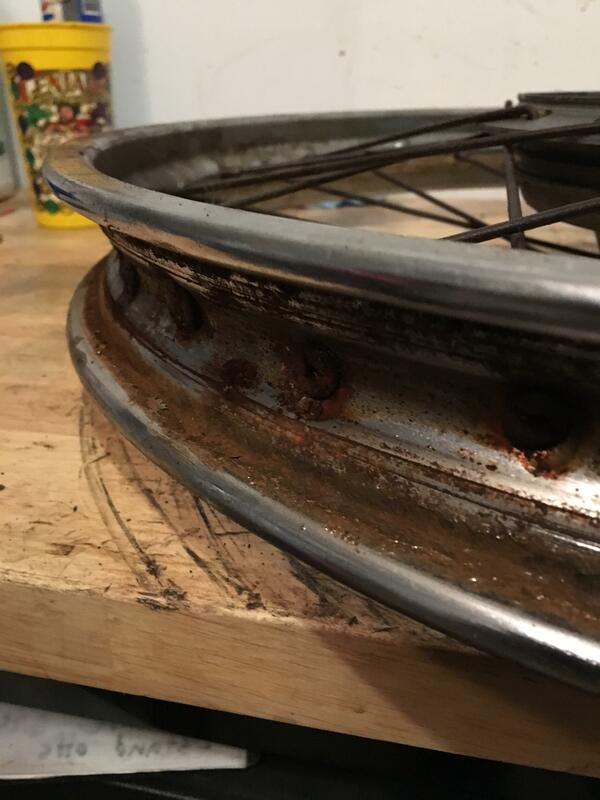 The rim isn't too bad, but the spokes are pretty well rusted. This was my first time doing any tire work. Breaking the bead was a little tough on this one, I think due to the rotted rubber and rusty grime that was caked on in there. That's it for tires today, they are too grimy so I'd like to power wash first to make my life easier. Here's the headlight bucket from the previous post, all dry. 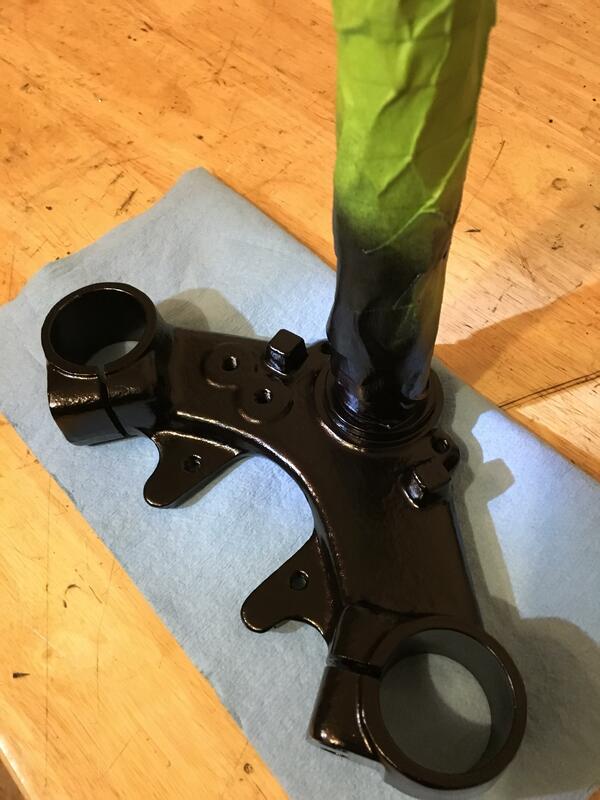 It looks infinitely better, and this paint, semi-gloss Tremclad (I know, not high-end stuff here) has a nice satin finish. And lastly for today, the lower rear fender. 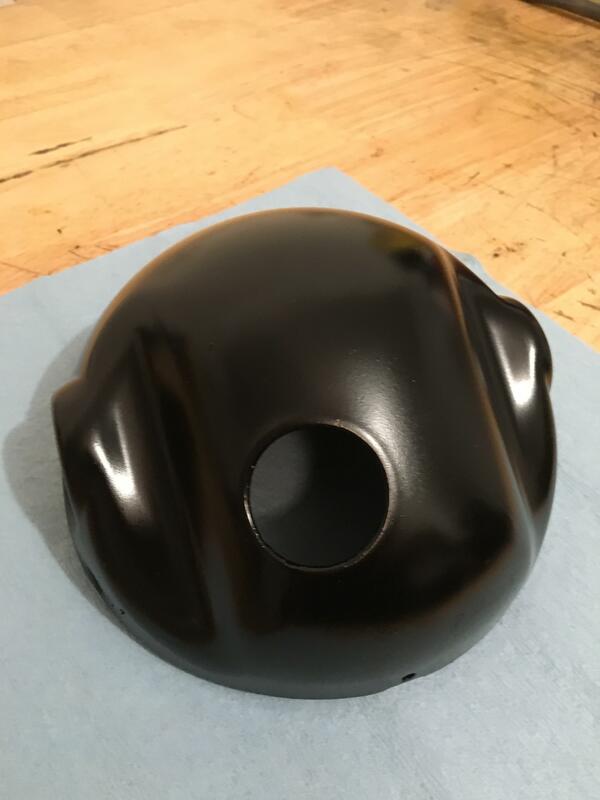 This is a plastic part, and this particular one seems to have had a hole burned in it at some point. I'm not sure how or why. But, staying true to form, this is the worst one I have so on the bike it goes. I'm not sure how I'll feel about this part being so damaged, it may get replaced later on depending on how much it bothers me. And now, mounted on the frame. 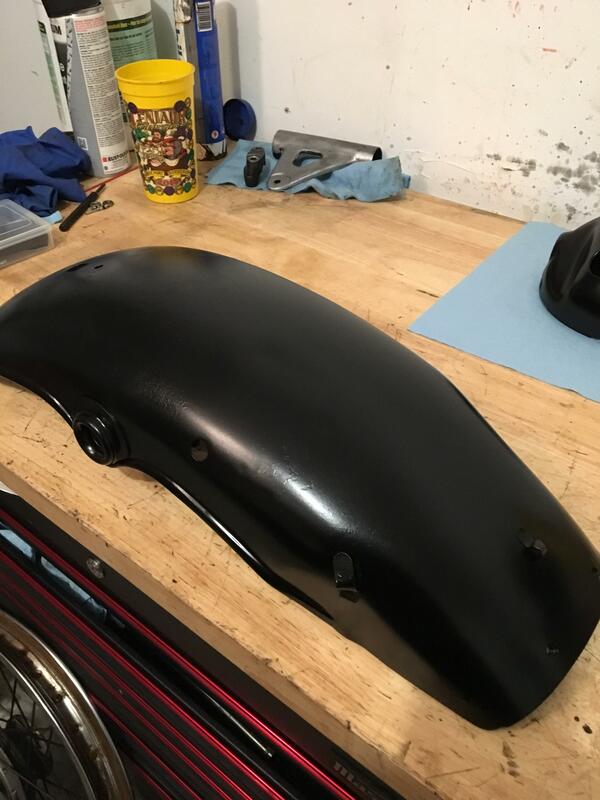 I just sprayed the front fender with Krylon Fusion black. We'll see how that goes, but like I said previously, I'm not holding my breath. The last time I painted plastic, it was a tragic tale. 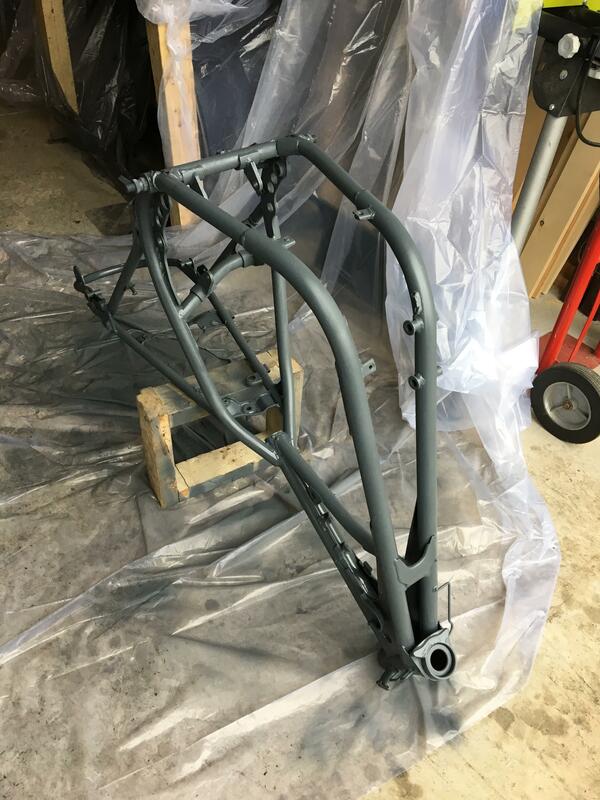 The Krylon Fusion also takes 7 days to fully dry, so it won't be on the bike until next week likely. I needed space in my "spray booth" (liberal use of quotations). The front fender was dry to the touch, so I gingerly put it on the bike to let it fully cure there. Next up is painting components more critical to getting this thing rolling. 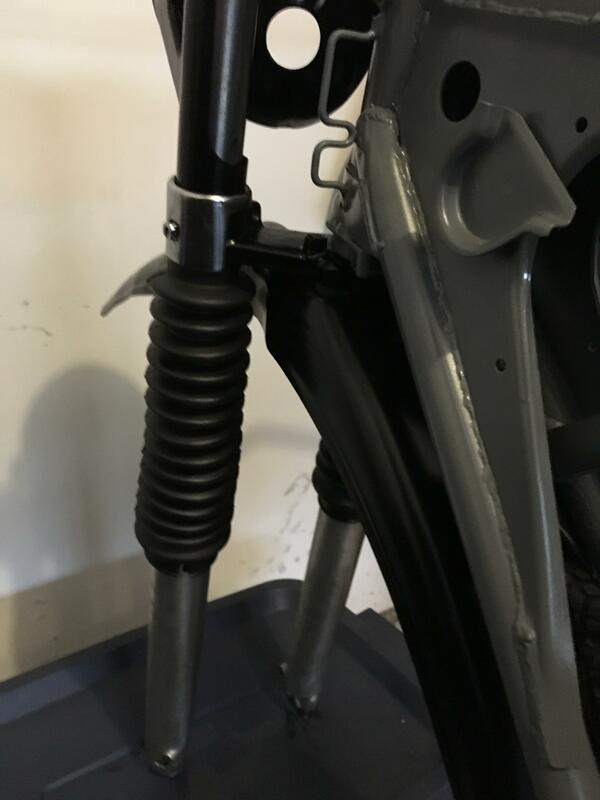 Kickstand, and brake torsion arm. The opposite (far) end of the torsion arm I suspect has been botched together at some point. 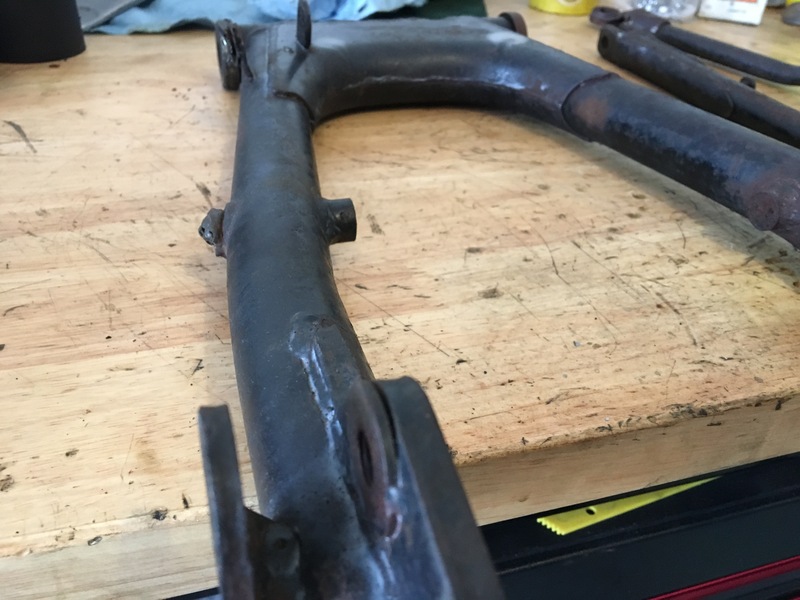 It's not beautiful, but the welds look strong and hopefully the dimensions are correct. I'll know for sure when I mount the rear tire. 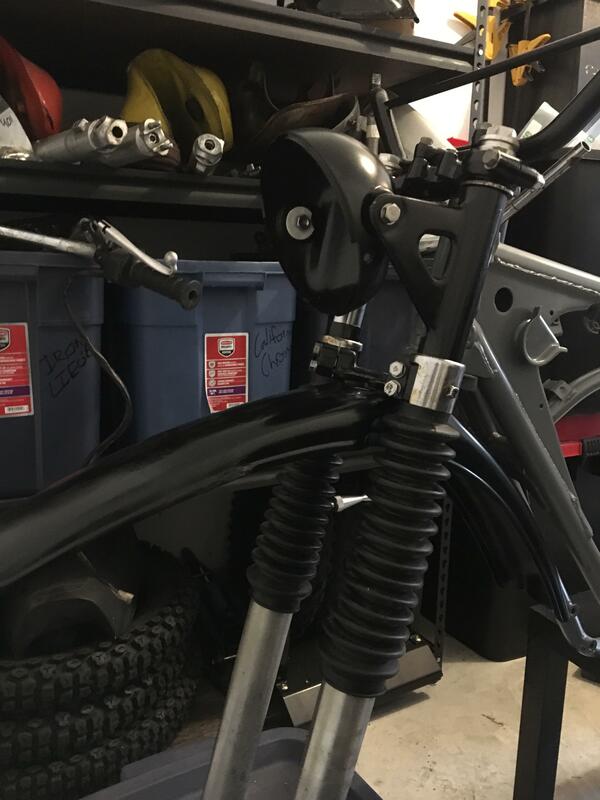 The swing arm. Not beautiful, but my other ones (being reworked by Denis) were worse. I cleaned up the passenger peg bosses with a dremel and a grinding disk. Painting all three (plus an extra fork ear I screwed up) black. 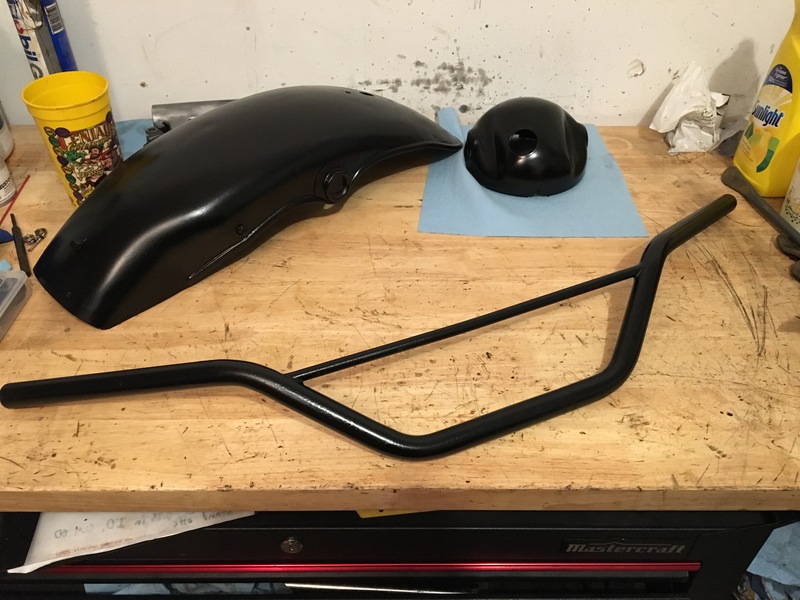 I decided to do the swing arm black, in order to keep this whole two-tone thing going. We'll see how it turns out. 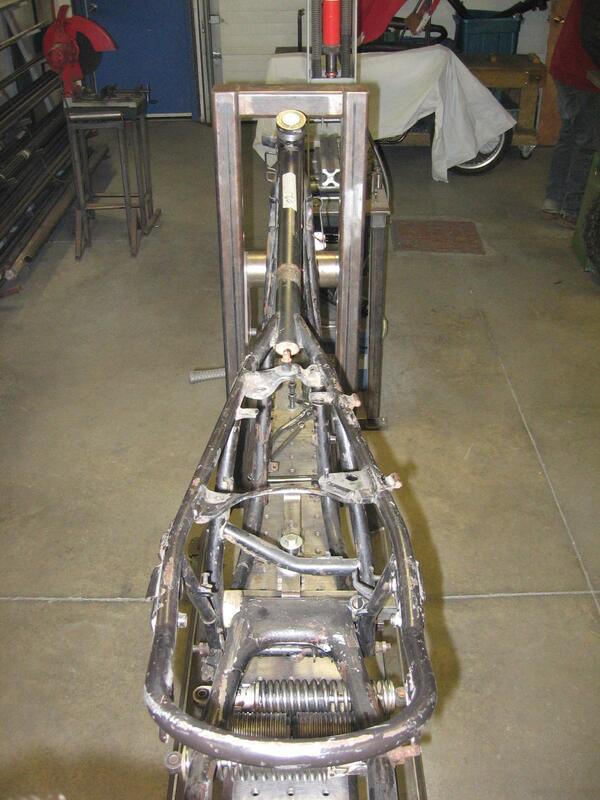 Tomorrow I head out to Belleville to pick up my two frames from CMR. I'm not sure I'll be doing anything with them until February. I want to have this one rolling before I leave for vacation near the end of December.